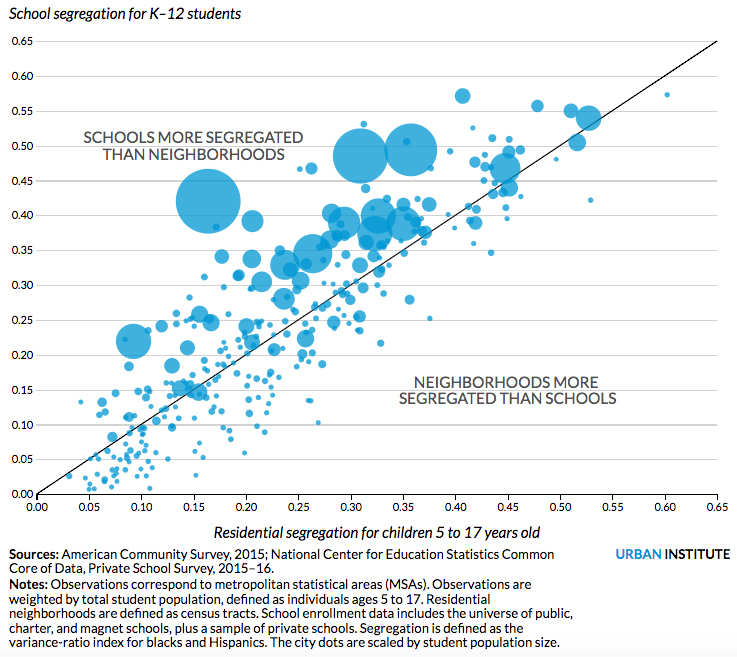 School segregation in America is highly correlated with our isolated neighborhoods. How does your city stack up? Springfield, Illinois, is like a lot of places in America: Its neighborhoods are highly segregated by race, with minority residents predominantly clustered downtown and most whites residing along the city’s outskirts. Something interesting is happening, however, in Springfield’s schools. While schools in most cities are slightly more segregated than their neighborhoods on average, the opposite is true in Springfield. The difference comes down to the way the city drew its school attendance boundaries, according to a new report by the Urban Institute, a left-leaning think tank. Rather than follow the city’s segregated housing patterns, Springfield purposely set out to create more diverse schools. In some cities, like Springfield, policies chip away at racial segregation inside schools — while those in other cities exacerbate it. Since most children attend campuses close to home, the prevalence of segregation in schools correlates highly with the racial composition of nearby neighborhoods. In fact, Urban estimates that 76 percent of the variation in school segregation between schools can be attributed to housing. And although district policies that encourage integration are helpful, something more radical must be done to eliminate school segregation outright, argues Tomas Monarrez, an Urban research associate and author of the report. “If you really want to destroy segregation — get rid of it and completely fix this problem — the only way to do that is to completely fix the problem of residential segregation,” he told The 74. America has a long and fraught history when it comes to both residential and school segregation. More than 60 years after the U.S. Supreme Court’s landmark decision in Brown v. Board of Education, which found intentional school segregation unconstitutional, America’s schools remain sharply divided along racial lines. Another recent report, in the Peabody Journal of Education, found that America’s largest cities have become more integrated in recent years even as schools have become more segregated. Meanwhile, a growing body of research has pointed to integration as an effective strategy to improve the educational outcomes among children of color. Cities’ school segregation tracks closely to the racial composition of their neighborhoods. Beyond housing, other factors contributing to school segregation include school assignment policies and the choices parents make about their kids. In the 1970s, Springfield faced a federal school segregation lawsuit that resulted in a mandated desegregation order. Under that plan, Springfield began redrawing school boundaries every several years as neighborhood demographics changed. In another report published earlier this year, Monarrez found that while districts can draw school assignment zones to create more racially integrated school systems, few choose to do so. 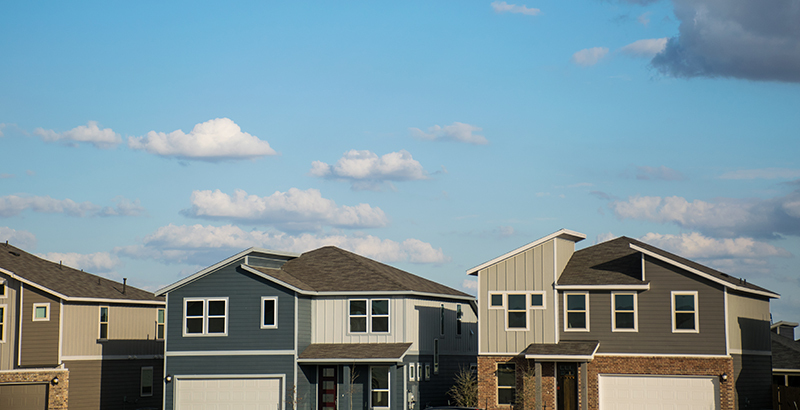 The link between neighborhood and school segregation “is always going to be there” since people don’t want to endure long commutes to school, he said. “However, these local governments have a little bit of leeway in how they tip the scale” toward integration. Most students are assigned to schools based on where they live. However, that strategy has been disrupted by the emergence of school choice. School choice has alleviated segregation in some cities, according to the Urban report, and exacerbated it in others. Monarrez is currently working on a study that focuses specifically on charter schools, one form of school choice, and their effects on segregation. One example is Newark, New Jersey. While the city’s neighborhoods are among the nation’s most segregated, its schools are even worse. But the introduction of charter schools and universal school choice may be mitigating segregation, according to the report. In San Francisco, however, it appears school choice made segregation worse. Since the district got rid of a school assignment process that considered students’ socioeconomics and academic achievement in favor of a system that prioritizes parental choice and school attendance boundaries, school segregation has increased. Adjusting school assignment zones and other education reforms could be promising strategies to increase integration, but Monarrez said the best approach — albeit a controversial one — could be found in America’s neighborhoods. “If we really want to end school segregation — which we probably do want to do — we’re going to have to address the problem of neighborhood segregation, and that’s going to get us into these hairier topics about gentrification and housing costs and the willingness of people to interact with each other when there are fundamental differences between them,” Monarrez said. Disclosure: The Bill & Melinda Gates Foundation and the Walton Family Foundation provide financial support to the Urban Institute and The 74.